Posted on 23rd March 2017 at 9:24 am. Of 53 cows put in calf, Wexford suckler producer Paul Barden was left with just 12 calves alive due to a BVD outbreak. And the devastation was caused by a bought-in heifer that turned out to be a PI. 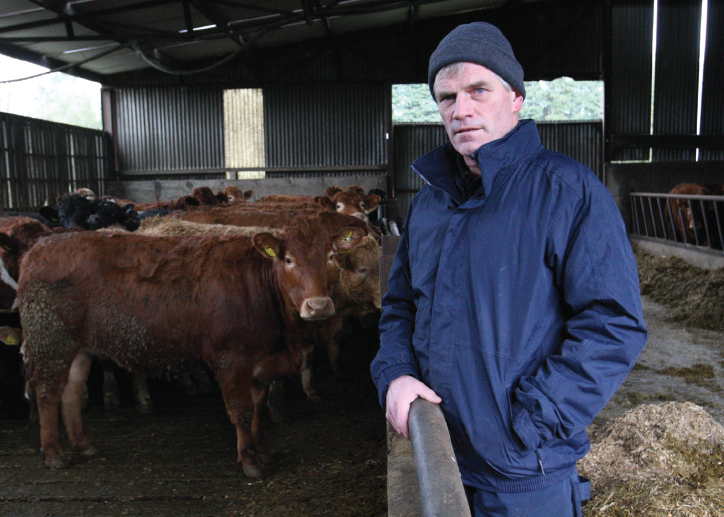 Paul, who farms at Donooney, Adamstown, experienced the BVD nightmare in spring 2014. He calved 52 cows in 2013. All calves were tissuetagged and were negative for BVD. He was very conscious of disease prevention. Cows were vaccinated against leptospirosis and salmonellosis. They were also vaccinated pre-calving to protect against scour in calves and he also had an IBR vaccination strategy in place. He had previously operated a closed herd and therefore did not feel the need to vaccinate against BVD. In summer 2013, he bought in eight heifers. And that is when the BVD horror story began. “I noticed one of the heifers was not thriving as well as the rest, but I had no reason to suspect there was anything seriously wrong with her,” said Paul. In September 2013, 53 animals were scanned in-calf, including the bought-in heifer. But everything changed when the cows started to calve in 2014. Paul tells the gruesome story “It was an absolute nightmare. Thirteen cows lost their calves before calving, including the bought-in heifer who aborted after about four months in-calf. Of the 40 calves that were born, we finished up with 12 that lived. “Some were born dead or died immediately after birth. When the first signs of the impending disaster began to appear, Tomás O’Shea bloodtested all breeding stock. One – the suspect bought-in heifer that had aborted – tested as a PI. She was immediately removed from the farm. The cows that did not produce a calf were sold. All remaining breeding stock were given a primary and booster vaccination with Bovilis BVD in advance of the 2014 breeding season. 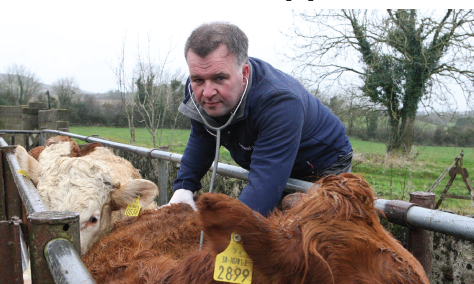 Annual BVD vaccination is now a rigid part of Paul Barden’s animal health programme. The number of cows in the herd dropped to below 40 in 2015. Paul bought in weanlings in order to “keep up numbers”. He has gradually increased the size of the suckler herd and will calve around 45 cows this year – a mixture of Salers and Limousin – with the progeny being reared to forward stores or beef.